Family Camp is often meant as a retreat and getaway for the kids, their families, and the interns and staff that accompany them. 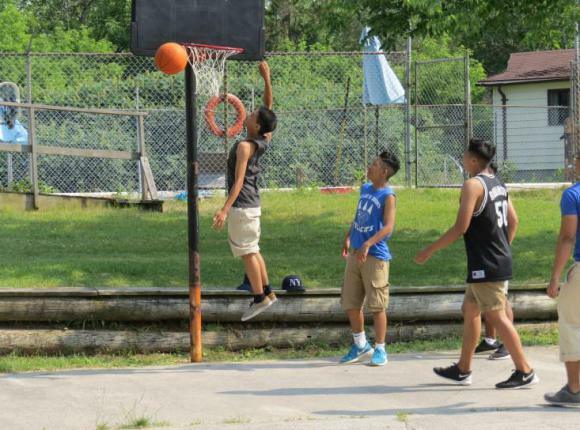 Each year, a bus load of teens, parents, kids, and adults are packed away and taken to Ignite Camp and Retreat Centre two hours out of Toronto. Set on a peaceful lake and surrounded by greenery and quietness, the centre is a perfect destination to step back from busy lives and the hustle and bustle of the city. Yet even at camp, the temptation to occupy ourselves with activities, events, and games is still there. Whether it’s canoeing, kayaking, swimming, playing team building games, or participating in archery, there are multiple ways to be occupied and busy. Couple the activities of the day with the late night talks, and Family Camp can leave one feeling more exhausted than when they first arrived! That’s why I really appreciated what one of the TCM staff suggested during debrief: to take some time for yourself to rest, to spend time in solitude and quiet, and to sit in the presence of God. I had been completely exhausted before Family Camp, overwhelmed by camp planning, birthday parties to attend, and hundreds of items to check off my to-do list. I came to Family Camp with my eyes already closing and my body barely functioning. Although I was excited to spend time with the kids and their families, excited to canoe and kayak and swim, a larger part of me just wanted to sleep through all four days. With all my exhaustion and tiredness and fatigue, I went to God. It would have been easier to just go to my cabin, close the door, and hide from the world, but this option would only provide me with temporary relief — my body would cease to be tired, but my heart would have been in the same place. On the last night of Bible Time with the Junior High Girls, I read out Psalm 23. After reading the passage out loud a couple of times, I asked the girls to find a quiet place in nature, and to be still with God. They could read the Bible, write in their journals, walk around the grounds and pray, or just sit and relax. When the girls had come back, there was a calmness in our group, as if all of us had just returned from a relaxing massage or a hot soak in a tub. They expressed that getting the time to just be with God, without having to do anything, was one of the highlights of their day. It was one of my highlights, too, not only of the day, but of the entire weekend.